Appspace 7.0 is a major release that is built on an all new microservices architecture, and includes various new features and enhancements, an improved user interface, platform optimizations, and bug fixes. This version is for both the cloud and on-prem deployments of Appspace. The 7.0 on-prem build available on March 29th 2019, includes all features, bug fixes, and escalations resolved from the 7.0-ac.1 to the 7.0-ac.29 releases. Appspace key services are able to run independently outside of the console, and can be individually scaled when load for any one area increases. This ensures loads can be better distributed across the platform, and each service expanded independently as required. Performance is improved as key services run and scale independently. Improved reliability of communications thanks to a new message bus. Faster isolation of performance and software issues thanks to better code segregation. Document database for more native storage. GUID-based object identification for global uniqueness. Flash is replaced with an HTML-based progressive web app (PWA). Appspace 7.0 introduces a brand new user interface and menu navigation that has been updated with a streamlined design for improved user experience. The streamlined Appspace menu is now available with a clearly visible side navigation bar. Appspace 7 introduces the Quick Actions menu, located in the top navigation bar, which provides shortcut links to key workflow areas in the Appspace console, that are most commonly used. An end-to-end channel and content management workflow with with customizable permissions and publishing options is introduced in Appspace 7.0. All channel types (playlists, live streams, and signs), and channel groups can now be managed in one place under a single unified workflow with extended approval permissions. Playlist - The Playlist channel is the biggest introduction in Appspace 7.0, as it combines the functionality of the folder-based channel from Appspace 6.x with the new content and permission workflow. Live - The Live channel remains functionally the same from Appspace 6.x, but can now be managed individually and independently. Advanced - The legacy sign channel is now known as the Advanced channel. The functionality remains exactly the same as all previous workflows, but wrapped in a newer interface that has been standardized. Assign to a single channel - The Appspace App running on the device will be locked to play only a single channel. Users can also enables device tags and a device group via the Advanced Options during the registration process. The Manual Registration option has now been moved under the Advanced tab in Devices. Here, users can continue to register legacy devices and Appspace App based devices with network policy files. The user invitation process is simplified and streamlined through a single workflow. You can now invite multiple users at once, and assign the user(s) to one or more user groups during the invitation process. 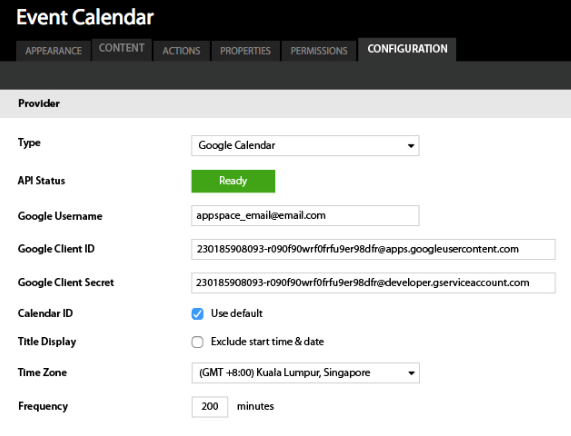 AE-3835 - The calendar date format is incorrect in an advanced channel (sign) schedule after an upgrade to Appspace 6.2.2. AE-3895 - Noticeable delay when loading Playout Properties. AE-3902 - High CPU utilization when managing users in the platform. AE-3903 - When a card content is updated in the Library, the device sync status does not change, and the content for the same card added to a sign with MediaZone linking is not updated. This build focuses on bug fixes, and performance improvements. This build focuses on bug fixes, and general platform stability. AP-15536 - Although published channels are deleted from a channel group, player updates are not triggered. AP-15653 - A confirmation message is incorrectly shown when Content Administrator tries to assign or remove the Publisher or Editor permissions in a playlist channel. AP-15799 - Appspace App fails to download content when syncing a live stream channel with an EPG provider configured. AP-15802 - The web client URL incorrectly redirects users to the Appspace console after logging in. AP-15840 - Incorrect icon displayed in device directory in Channels. AP-15849 - Published Channels or Channel Groups get duplicated if published to both device group and ‘All devices’. AP-15853 - Appspace App on UWP stops playing when folder scheduling is enabled in a playlist channel. AP-15880 - Device displays a blank screen, when registered after publishing a channel group to “All devices”. AP-15902 - Channels or channel groups are still displayed on the web client, after being unpublished using the “All users” tag. AE-4135 - Some sub-networks do not appear in the Select Network page when switching networks. This build includes a new card, and focuses on bug fixes, and general platform stability. An all new Meeting Room card that enables you to setup informative and interactive touch-screen enabled instant meeting room bookings on any compatible Android-powered tablet running the Appspace App. Book Now - allows users the option to book instantly, up to a maximum of four 30 minute blocks, (2 hours), depending on the start of the next scheduled meeting. Advanced Booking - allows users to book a meeting room in advance for the same day only, by selecting the preferred time blocks, with each block a minimum of 15 minutes. However, Advanced Booking can be disabled if this feature isn’t required. Extend Booking - allows users to extend their current meeting room booking, up to a maximum of four 30 minute blocks (2 hours), if the meeting room is available. End Booking - allows users to end their current meeting room booking, by tapping the End Meeting button if the user had booked the meeting room through the Room card on the device. If the meeting room is scheduled other than on the Room card, the End Meeting button will only be displayed if the meeting had been extended through the Room card, in which tapping the End Meeting button will only end the extension of the meeting. Displays upcoming meetings - displays up to four meetings at a time or all meetings until the end of the day if current time is before 6pm, or meetings up to 6 hours ahead if current time is after 6pm. Syncing is done every minute. Display orientation - the card can be displayed in landscape or portrait orientation, depending on the device configuration. Theme customizations - customizations to background color, background image, available room color, and custom logo. AP-14345 - In Networks, the “Assign Permissions” overlay UI breaks when assigning more than 20 administrators. AP-14801 - Disabling or enabling content requires approval, even after unchecking the “Disable content approval” checkbox. AE-4165 - Network is duplicated and displayed as sub-network in the change network section, after upgrading the NV01 server to Appspace 7.0. AE-4166 - An ‘unexpected error’ is returned when attempting to create a card, if the card theme has permission restrictions. AE-4168 - Network is duplicated and displayed as sub-network in the change network section, after upgrading the NV01 server to Appspace 7.0. AE-4185 - A sign with a remote control widget that is imported into Appspace 7.0 does not function. AE-4196 - Default network in the device registration page incorrectly displays the root network. This build includes a minor UI improvement for content tags, and focuses on bug fixes, and general platform stability. User-friendly tagging function with improved UI. AP-15704 - Inherited roles from user groups in the root network are not displayed in the user list, when logged in as a sub-network user. AP-15962 - In Channels, user incorrectly retains the Publisher role even after the associated channels have been deleted. AP-15977 - Notifications icon does not display the correct total number of notifications. AE-4186 - The notifications icon on the dashboard indicates new notifications are available, however no notifications are listed when the icon is clicked upon. This build includes a minor feature enhancement, and focuses on escalations, bug fixes, and general platform stability. If a user has access to more than one network, the option to set the home network will be shown. If a user has been removed from a network, then the assignment will automatically choose the previous network. All users have the option to set their home network at the root network, however access to resources at the root network will depend on permissions. If a user does not have permissions to any resources in the root network, then navigating to that network will simply not have any items which will be the expected behavior. AP-15916 - The channel group Publisher is unable to delete the advanced channel after deleting the channel group, if the advanced channel was added to the group via the Settings page. AP-15957 - Unable to login to Appspace Cloud after an upgrade to Appspace 7.0. AP-16014 - Unable to publish or un-publish channels and channel groups to a device. AP-16038 - All authorization transactions are being incorrectly recorded with “user” as the username. AP-16042 - Hovering on the Knowledge Center (?) icon in the console navigation bar does not display help information or links. AE-4172 - Unable to login to Appspace Cloud after an upgrade to Appspace 7.0. AE-4183 - Frequent time-outs during activity on cloud servers running Appspace 7.0. AE-4189 - Frequent time-outs during activity and when accessing channels after upgrading to Appspace 7.0. AE-4221 - After logging in to Appspace, a pulsing Appspace icon is displayed until it times out, and returns to the login screen again. AE-4223 - Clicking on the center of a sign does not open the Visual Editor as it should. AE-4243 - Unable to login to Appspace Cloud after an upgrade to Appspace 7.0. AE-4257 - Unable to login to Appspace Cloud after an upgrade to Appspace 7.0. AE-4280 - Hovering on the Knowledge Center (?) icon in the console navigation bar does not display help information or links. This build focuses on escalations, bug fixes, and general platform stability. AP-16076 - The Save button is not enabled unless certain fields are filled, when editing a Rooms or Announcement card. AP-16082 - The Home Network field incorrectly displays the network path instead of the network name in the Edit User Profile Details page. AE-4220 - Unable to export the devices list to a CSV file. AE-4244 - Unable to export the devices list to a CSV file. AE-4247 - The Network Health widget fails to load on the dashboard after upgrading to Appspace 7. AE-4293 - Unable to view full IP address in the IP column of Networks. This an internal build focused on general platform stability. This build includes enhancements to the Meeting Room card, backend optimizations to the Webhook service, and focuses on bug fixes, and general platform stability. Meeting Room cards are now supported on iOS based devices, in addition to support for Android. Check-in option for a meeting - allows users to check-in to a meeting. If no-one checks-in within 10 minutes after the start of the meeting, the room booking is automatically cancelled. Show available time slots - available meeting time slots will be displayed on the meeting room display page. Naming of instant meetings - allows meetings booked via instant booking to be named, and not just displayed as “Instant Booking” on the meeting room display page. Show/hide upcoming meetings - displays the upcoming meetings for the day at the lower right column of the meeting room display page. Match the background color with the status color - allows the status accent color (Available: Green, Booked: Red, Check-in: Amber) to be reflected in the background, consuming the entire meeting room display page, instead of just the right panel. Support for private meetings - meetings configured as “private” on the calendar provider, will have the meeting name hidden, and displayed as “Private Meeting” on the meeting room display page. AP-16208 - Selecting to publish a channel to ‘all users’, does not retain the save after the browser is refreshed. AP-16233 - Subscription Overview widget on the dashboard unable to retrieve User ID and Device ID usage, on private cloud. AE-3968 - Appspace 6.2.2: Downloads tab unable to retrieve list of downloads from the server. AE-4261 - Unable to retain EPG settings for live channels. AE-4282 - Original names of duplicated channels are displayed on the devices page even after being renamed. AE-4285 - Original names of duplicated channels are displayed on the devices page even after being renamed. AE-4290 - Unable to create advanced channels. AE-4304 - Unable to add recipients for network notifications. AE-4313 - If the network name is too long, it does not fit within the field as it should, in Users. AE-4342 - Appspace 6.2.4: Downloads tab unable to retrieve list of downloads from the server. AE-4343 - Appspace 6.2.3: Downloads tab unable to retrieve list of downloads from the server. This build focuses on technical improvements, escalations, bug fixes and general platform stability. AP-15973 - Device is unable to retrieve network properties. AP-16125 - In an advanced channel, the Manage Content table in the Overview tab does not display correctly. AP-16144 - In an advanced channel, the Schedule tab is duplicated when saving edits in the Settings > Overview page. AP-16218 - Device unable to sync channel assigned to it when the playlist channel name contains an apostrophe (‘). AP-16405 - Playlist channel fails to retrieve content after the content is updated in the Library. AE-3309 - In Networks, content size in the network summary is incorrect. AE-3681 - Unable to delete devices from Network. AE-3798 - 100% CPU utilization when content is added to an advanced channel. AE-3840 - Significant delay (2 minutes) when replacing or adding content to the Media Zone widget. AE-3860 - Unable to delete tasks from Device Tasks. AE-3895 - Significant delay (4 minutes) to load the Playout Properties tab. AE-3946 - New user added to a subnetwork, does not exist when searched from the root network. AE-3970 - Unable to delete devices from Network. AE-4011 - Unable to create Card theme if MySQL server is installed in secure mode (on-premises). AE-4104 - Unable to see full list of deployments, as user does not inherit Portal Administrator rights from user group. AE-4129 - Updating Appspace requires patch to be installed. AE-4133 - Portal Administrator unable to delete subnetwork in Appspace 6.2.4. AE-4161 - Registration page submitted by new users, refreshes without redirecting to the registration success page. AE-4169 - In Networks, content size in the network summary is incorrect. AE-4182 - SSO settings does not save, and reverts back to using iDP metadata. AE-4238 - Timestamp on device does not update. AE-4242 - Content in playlist channel gets deleted when adding card to folder. AE-4303 - A device name change is not saved. AE-4311 - Unable to move user group from sub-network to root network, if user group is assigned with a user role. AE-4327 - Disabling content scheduling creates duplicate content in the Media Zone widget. AE-4358 - Unable to access shared folder, if user does not have access to parent folder or library. AE-4361 - Device plays the network default channel instead of the channel assigned during registration. AE-4380 - Unable to load content from library into advanced channel. AE-4386 - Error when accepting user invitation. AE-4409 - Error when accepting user invitation. This build focuses on bug fixes and general platform stability. Improvements to the channel preview feature, displaying a scrollbar when necessary. AP-16085 - When you edit a Channel Group name and type in a name similar to an existing channel group, the system allows you to save it, which shouldn’t be the case. By default, we do not allow two channel groups to have the same name. AP-16362 - After you copy (duplicate) a channel, the channel listing does not automatically sort alphabetically as it should. AE-4319 - Device status indicates online in the Publish tab in a sign, however the status for the same device is shown as ‘out of sync/communication lost’ when viewed in Devices. This build is a maintenance release focused on escalations and general platform stability. AP-15568 - Portal Administrator unable to switch network location, after switching to another account. AP-16570 - Portal Administrator unable to invite user, after switching network locations on another account. AP-16571 - Portal Administrator unable to register device, after switching network locations on another account. AP-16572 - Portal Administrator unable to assign channel, after switching network locations on another account. AP-16588 - When a Portal Administrator clicks on the Find Devices button on a channel’s Publish tab, no results are returned, after switching network locations on another account. AP-16589 - Error page returned when assigning Live Channel as a single channel after switching to another account. AP-16592 - Network list does not update after switching accounts, as a Portal Administrator or Account Administrator. AE-4393 - Unable to extract the Proof of Play Metrics report for Cisco DMP 4310 device. AE-4231 - User disappears from user list when user invitation is resent. AE-4469 - Channels does not load after upgrading to Appspace 7.0. This build includes improvements to the device deletion architecture, bug fixes, and escalation fixes. Support for Chrome OS version 64 (in addition to iOS and Android). You can now configure Meeting Room cards on your Chrome based devices, and leverage the room booking services with Google or Microsoft calendar providers. CSS layout fixes for the time slot availability screen in portrait mode on iOS. When room is offline, a round status icon in red is displayed. When room is offline, last update time is displayed. When room is offline, ‘Room Offline’ is displayed instead of meeting name or room available information. Improved exception error handling during calendar provider authentication process. Optimizations to the back-end device deletion process to improve how Appspace handles devices that have been unregistered. AP-16137 - Network name with Unicode characters does not display correctly in the User Profile window. AP-16148 - Unable to upload media to a selected sub-folder with more than three levels via the Quick Actions menu. AP-16149 - In the Overview tab in a sign, editing the Caption field for the first time may disable layout scheduling. AE-4492 - Timezone settings reverts back to default on Appspace cloud. This build includes enhancements to the Library, bug fixes, and escalation fixes. Content expiration currently can only be set individually, and once the expiry date is activated, the content is marked for deletion, and will be deleted within 24 hours. This new feature, when enabled, allows the system to automatically delete unused or unwanted content to efficiently manage storage space in the Library. Automatically expire and delete content. Automatically delete unallocated content based on age (30 days, 60 days, 90 days, custom). Automatically delete any content based on age (30 days, 60 days, 90 days, custom). If you have already set an expiry date for a content, when either of the auto deletion rules are set, the expiry rule set for the specific content supersedes these rules. AP-15986 - Users without Network Administrator permissions are able to register devices to any network. AP-16467 - Network Health widget on the dashboard displays the error message, “Error retrieving widget information”. AP-16469 - Pending Approval widget on the dashboard displays the error message, “Error retrieving widget information”. AE-4388 - A fade to black transition occurs between images in the Media Zone in a sign channel or in a playlist channel. AE-4508 - Appspace 7.0 console does not display correctly on Internet Explorer 11. This build is focused on backend optimizations to the channel publishing directory architecture, including improvements to the way scripts are being generated for several channel types, for increased performance. AP-16195 - When you copy a channel, and then publish the channel copy, it does not display on the device. AP-16196 - When you copy a channel, and then publish the channel copy, it does not display on the device. AP-16609 - When you copy a channel group, and then publish the channel group copy, duplicate channel groups are displayed on the device. This build is focused on backend optimizations, bug fixes, and escalation fixes. AP-16095 - Performing a keyword search and filtering by user role in the Publish page, does not return results based on the keyword. AP-16118 - When you click Find users and select a user role in a channel’s Publish tab, the filtered results are inaccurate. AP-16734 - Publishing a channel to all users, a specific user, and user groups, displays duplicate channels. AP-16760 - A timestamp mismatch issue between Appspace servers and devices in servers running devices that have no channels assigned or have legacy PC players; when a channel is assigned to a device, the device does not play the channel on the TV. AE-4496 - Unable to delete advanced channels in bulk. AE-4509 - When the name of an advanced channel is changed in the console, the change is not reflected on the assigned device(s). AE-4519 - The “Error saving content” error message is displayed when adding tag rules to content in a Media Zone widget. AE-4528 - After making a copy of an advanced channel, unable to delete the copied channel. AE-4541 - The “Error saving content” error message is displayed when trying to schedule content on a Media Zone widget. AE-4552 - Unable to delete advanced channels. This build is focused on escalation and bug fixes. AP-16198 - When inviting user, the user group field incorrectly displays usernames instead. AE-4425 - The Calendar widget does not display events from Office 365 accounts. This build includes enhancements to the Announcement card, escalations and bug fixes. AP-16796 - User in a subnetwork inherits incorrect permissions to an advanced channel (sign). AE-4448 - The Preview tab in a channel does not display video content. AE-4474 - User permissions are not inherited correctly. AE-4573 - Unable to delete channels with names containing the ‘#’ special character. A minor feature to enable browser notifications when Flash is blocked by the browser. The release of Chrome 69 blocks Flash by default, thus the advanced channel (sign) visual editor and channel preview screens try to continuously load, without prompting the user that the Flash plugin has been disabled or blocked on the web browser. AP-16824 - Unable to switch child network locations within sub-network, even when having channel permissions on the parent network. AE-4539 - Duplicated content items displayed in the Media Zone widget. This build includes enhancements to the Advanced Device Registration workflow, escalations and bug fixes. Registering using the device serial number. Currently this feature is only available for BrightSign and LG devices, as the serial number is embedded in the device fingerprint. You can now choose to pre-register a device by creating a device record first in the console, without a physical device (for utilization by a device later on). Pre-registering a device allows customers and 3rd-party integrators to display Appspace channels on non-standard devices, as long as the device has a HTML5 compatible browser. The Advanced Registration workflow is now standardized with the same look and feel as the standard device registration workflow. 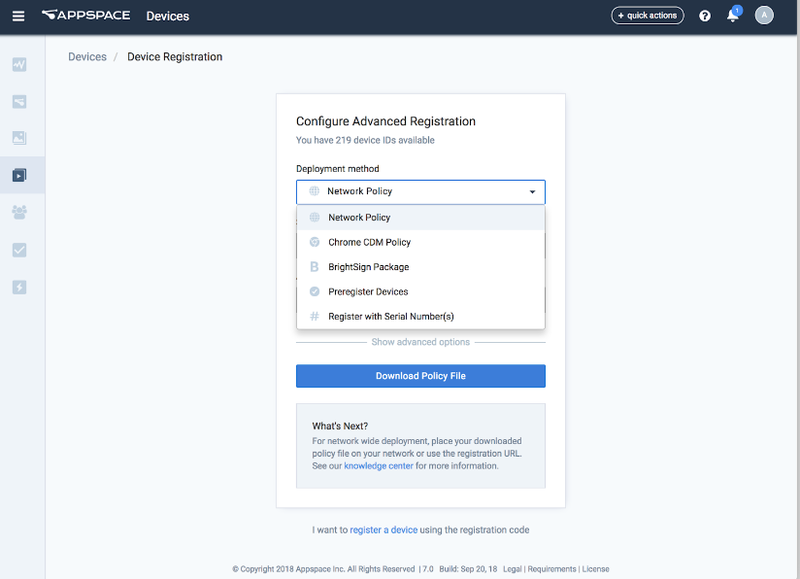 All device registration functions will be accessible from the device registration page; when you install the Appspace App, or via the Add devices function in the Devices tab on the Appspace console. All advanced registration methods using policy files, serial numbers, and pre-registering devices have been consolidated on the same page. AE-4592 - Calendar in Playout Properties for a sign does not function when scheduling content on the Media Zone widget. AE-4602 - When channel name link is clicked to change channel assigned to a device in the Devices tab in the console, the channel list page does not load on Safari. AE-4642 - When channel name link is clicked to change channel assigned to a device in the Devices tab in the console, the channel list page does not load on Internet Explorer 11. This build includes enhancements to the advanced channel, escalations and bug fixes. Focused on improving how advanced channels (sign) behave, we have leveraged on the Progressive Web Apps (PWA) technology that utilizes HTML5-based player engines to render all Flash components within the advanced channel framework, and provide complete compatibility for modern browsers and devices. This inherently eliminates the need for users to manually enable Flash, or provide for explicit permissions to run Flash plugins on the web browser, allowing users to preview Advanced Channels and the channel’s public link seamlessly. The Web View card is updated with a new option allowing web content to be interactive, such as users displaying maps or content that can be scrolled when using a touchscreen display. AP-16825 - Users with widget permissions levels in Signs, are able to access additional tabs meant for Content Administrators only. AP-16855 - Notification to create Channel Groups displayed to users whom do not have permissions to create channel groups. AP-16862 - Access to Advanced Channels (Sign) is not available to users with Publisher permissions. AP-16863 - Access to own playlist channel is not available to users with Publisher permissions. AP-16864 - Access to created Advanced channels is not available to users with Publisher permissions. AP-16865 - Copy channel function is displayed to users whom do not have permissions to create channel groups. AP-16937 - Users with Publisher or Editor permissions, should not be able to view or click “Create Channel” from the Quick Actions drop-down menu. AP-16938 - User Profile displays “Publisher” instead of “Editor” for users with Publisher permissions. AP-16949 - The Channels or Channel Group tab is not available to users with Publisher permissions. AE-4393 - Unable to extract a playout metrics report. AE-4571 - The widgets API Get method retrieves channel widgets from the upper network. AE-4619 - Unable to transcode videos from a shared folder. AE-4622 - Unable to assign Content Administrator or Network Administrator permissions. AE-4628 - Network Administrator unable to move devices between networks. AE-4639 - Playout metrics reports a single content impression as 4 times more, when there is more than one content schedule. AE-4647 - Unable to transcode videos from a Shared folder. AE-4648 - Unable to view custom shared folder. AE-4694 - Orange error screen is displayed when clicking the Preview or Preview Device link in the Device page. This build includes enhancements to the advanced channel editor, YouTube card, escalations and bug fixes. Advanced channel (sign) editor is updated with the Progressive Web App (PWA) technology. This is the final phase in fully replacing the legacy Flash player engine from our platform, in which the advanced channel editor is updated to use the current Appspace PWA. In a previous release, the Flash-based preview engine was replaced. An update to the YouTube card allows automatic video playback on devices running Chrome OS 66 and above. This is due to an autoplay policy enforced in Chrome OS 66, where videos will no longer autoplay if no user interaction is detected. A workaround by Appspace is to mute the video layer. Edit mode in the console: When editing the card within the console, videos will automatically play with sound as there is user interaction. Playback mode on the device: Audio is muted during video playback in order for regular playback to proceed. This update only affects devices that are not running in Kiosk mode, and does not effect Chrome devices that are already running in Kiosk mode. AP-17015 - “Preview device” link is not displayed on the device page, even when device is assigned to a playlist channel or live stream channel. AE-4347 - The ‘Change network’ link in the Appspace 7 console is missing intermittently. AE-4460 - The same device is listed multiple times in a network list. AE-4529 - A user from one network is able to incorrectly access another network without the correct privileges. AE-4615 - Content Summary section is not displayed on the Appspace App for Android. AE-4672 - User inherits permissions despite not being in a group with those permissions. AE-4677 - Timeout occurs when browsing the Downloads page. This build includes enhancements to the device settings page in Devices, and the Publish tab in Channels, escalations, and bug fixes. A completely redesigned new user interface for the device settings page in Devices, (displayed when clicking the device name link within the Devices listing page), that allows users to view and edit various device information on a single page. The previous Settings, Status, Content, and Properties tabs have now been consolidated into two tabs, which are Overview and Settings. In the Overview tab, you can view the device details, preview content, and view a list of all the channels and content that have been assigned to the device. The device startup URL for pre-registered devices can also be obtained here. In the Settings tab, you would find two additional sub-tabs, Configuration and Device Properties located in the left column. In the Configuration tab, you can configure the channel selection mode, display orientation, sync mode and alerts. In the Device Properties page, you can edit, add or delete device properties for the device. Booking 7-days ahead - You can now book a meeting room up to 7-days in advance, if the option is enabled when creating the card. Video as background - Setting a playlist channel as background has been expanded to support video content. 24-hour time format - You can now set the time in 12 or 24 hour formats. Added visual configurations - these features can now be configured: background mask, room label, and color for the Check-In and Occupied statuses. Display room facilities - Configure and display available room facilities from a calendar provider, as icons on the card. This is also configurable via a device property. Currently only supports the Google Calendar provider. External integration - Developers can now integrate the Meeting Room card using post messaging to listen to events, and send commands. The Publish page in Channels receives an updated UI with an added feature that allows you to publish Channels directly to an entire network that the user is entitled to and its sub-network, in addition to the usual devices, device groups, users, and user groups. AE-4620 - Audio from multiple video content plays simultaneously on the Youtube card. AE-4714 - Unable to set static IP address for BrightSign devices during the advanced device registration process. AE-4754 - When viewing content listed in a Media Zone in a sign channel, the Dynamic Media fails to generate a thumbnail of either the content or its placeholder. AE-4762 - When the name of a duplicated advanced channel (sign) is changed, the new name is not reflected in the Devices page. AE-4825 - Incorrect number of linked media zones listed. This build includes Appspace UI enhancements, escalations, and security bug fixes. AP-17102 - When a user is removed from the console in Cloud, the change is not reflected on the on-prem instance. AP-17445 - Network Administrator on a sub-network is able to view information on the root network. AE-4569 - Unable to invite user during migration from on-prem to cloud. AE-4797 - Insufficient storage available when uploading content on a multi-tenanted account. AE-4822 - Blank screen displayed when inviting users on Appspace Cloud. AE-4827 - Default schedule does not display when scheduling is enabled on a Data Only channel. 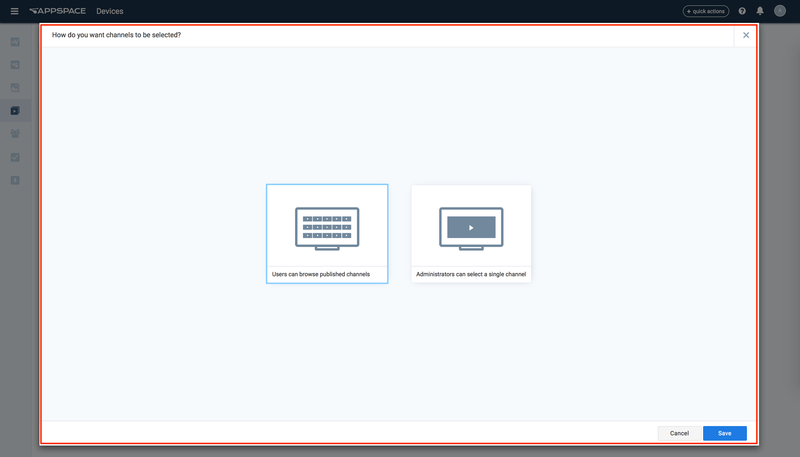 AE-4852 - Blank screen displayed when inviting users on Appspace Cloud. AE-4864 - Text widget does not display the dollar symbol and number ($10.00), correctly. This build includes an escalation fix. AE-4913 - After a device is registered and assigned a channel, the device GUID is displayed instead of the device name in the Channel > Publish page. This build focuses on escalation fixes only. AE-4836 - The Subscription Overview widget in the Appspace dashboard displays incorrect server license information. AE-4885 - Duplicate network listed in Device Tasks. AE-4915 - User permission issues after upgrading to Appspace 7. AE-4919 - Uploading a card template to Cloud displays the error message “fail to create a screenshot for the theme”. AE-4921 - The embed code for a public sign channel is not generated on the channel Overview tab. AE-4922 - When a group library is selected, content from other group libraries are visible. AE-4943 - When an advanced channel is copied, the content items in the Media Zone widget of the original advanced channel are duplicated. 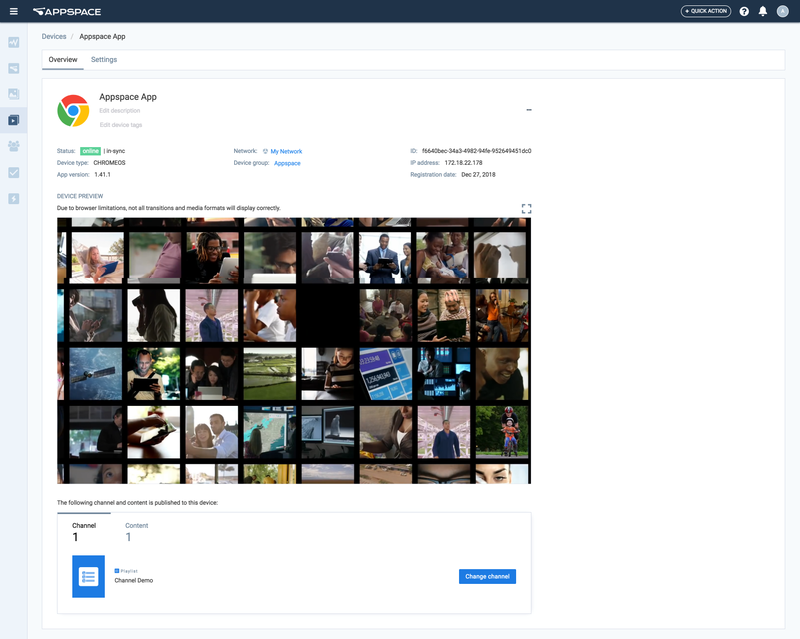 Appspace now supports wallpaper and alerts for Cisco Collaboration Endpoint (CE) devices via an integration feature, which leverages the background image API on CE devices to upload and display content from an Appspace playlist channel. The wallpaper content changes periodically based on the channel sequence and play-out durations, when the CE device is in an idle state. CE devices still consume a Device ID, however device registration is via a macro created by an administrator within the Appspace console. The macro will contain sufficient registration information which can be deployed to one or more CE devices from the Cisco Webex Control Hub. The devices must be running the Cisco Collaboration Endpoint Software 9.4 (or greater) or the Cisco Room OS. Users can now perform searches more efficiently in the Appspace console. Matching results are displayed from the drop-down list when keywords are being typed in. This enables quick access to channels, channel groups, devices, device groups, user, and user groups. Users can also edit pages directly from the search results, if they have the required permissions. If the edit tab is available, the profile icon is displayed to the right of the navigation bar allowing users to preview or download the profile page. If the edit page is not available, the profile page hyperlink is displayed with an edit button to redirect users to the appropriate sections. For users without edit permissions, a read-only profile page is displayed, with the hyperlinks disabled. The Add Content workflow has been improved to provide users with the ability to configure the content’s playout properties (transition, aspect ratio, duration, schedule), when adding the content to a playlist channel. Previously you could only edit the properties after content has been added and the playlist channel is created. AP-17267 - Portal Administrator unable to import Transcoders. AP-17654 - “Undefined” is displayed on the channel / channel group listing when the “Publish to network and subnetworks” option is used. AP-17818 - Content sent for approval that expires before approval should be removed. AP-17845 - Common Library is still accessible to administrators, even when the permission has been set to “No one can access”. AE-4842 - Unable to access the Appspace Cloud server. AE-4857 - Error displayed with loading content to be approved. AE-4865 - The advanced channel (sign) editor does not display content in layouts. AE-4880 - Unable to access the Appspace Cloud server. AE-4884 - The advanced channel (sign) editor does not display content in layouts. AE-4893 - Unable to add content to playlist channel from Shared folder. AE-4895 - BrightSign devices deployed with incorrect time zone settings. AE-4908 - Unable to login to Appspace Cloud server. AE-4922 - Content within a group library is displayed in all libraries. AE-4946 - An error, “One or more content files failed to remove”, is displayed when deleting multiple content in a playlist channel. This build includes a new card, and focuses on escalations and general platform stability. An all new Data Visualization card that enables you to create progress bar, donut, and line charts, with a variety of multiple layout options, customizations and animations. This is a full Appspace supported card, which will include periodic enhancements and refinements. The Data Visualization card also allows for custom logos to be uploaded, and positioned freely anywhere within the layout. The custom logo can be resized and is displayed at the topmost layer. The Donut Chart card under Community Cards will be deprecated with the introduction of the Data Visualization card. The Meeting Room card has been renamed to Room Schedule card, as part of our rebranding initiative. AE-4857 - Error displayed when trying to load the content playlist for approval. AE-4941 - Unable to delete multiple pending users. This build includes escalation fixes. AE-4986 - An error, “Failed to import. Please try again,” is returned when importing an advanced channel (sign) . AE-5031 - Unable to change the accent color for the app theme via Admin > App Configuration on the Appspace menu. AE-5036 - When editing content properties in a channel, the bitrate unit in the Additional Info window should be ‘kbps’ instead of ‘bps’. AE-5044 - Unable to enable legacy administrator mode using a network property. Although multiple advanced (sign) channels have been added to a channel group, when viewed on the Appspace web client, only one advanced channel is displayed. When inviting multiple users, the error message, “There was a problem sending your user invites. Please try again.”, is displayed. This may be due to an unoptimized database, or insufficient resources. A workaround to this is to limit the number of users invited at a single time. Try inviting just 5 users at a time, before attempting to invite more. The Appspace Installation Center may not be able to install the IIS URL Rewrite feature correctly if the Shared IIS Configuration is enabled.